Epano Arcanes is 16km south of Iraklion on the Iraklion - Knossos - Arhanes road. 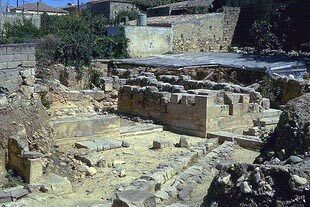 The area is a major Minoan site, and in addition contains several Byzantine churches. The town is in the middle of the vineyard district and exports wine, raisins and grapes - a grape and wine festival is held in July. Arhanes is also the location of three on-going archaeological excavations on Minoan sites. You may only view these through fences since they are closed to the public.